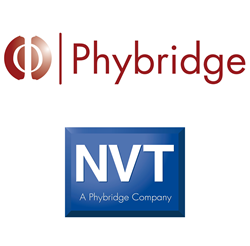 Phybridge, leading provider of long reach transmission solutions for Communications and Physical Security industries, announced today the acquisition of NVT effective July 31, 2015. NVT will operate as a division of Phybridge focusing on retaining its position as leaders in transmission products for the Security market. The strategic union will increase their leading roles as long reach PoE and Ethernet over new or legacy coax and UTP cable enablers. Phybridge was the first company to introduce switch technology that delivers Ethernet and PoE over a single pair of wire, with four times the transmission distance of traditional Ethernet. Their switches permit system migration from traditional CCTV and telephone systems to IP based technology. “Phybridge is bringing its pioneering Long Reach Ethernet technology into the security market which will allow NVT’s customers to move to IP with absolute confidence,” said Phybridge Founder and President, Oliver Emmanuel. With over 400,000 global users, Phybridge switches are recognized and deployed by many organizations including Cisco, Avaya and Mitel, and are rapidly leading a new standard in power over long reach Ethernet. Headquartered in Toronto, Canada and stocking/sales/support locations in San Francisco, California, USA, London, UK, Mexico, Columbia and Singapore, Phybridge is well equipped to supply and support your application needs. For more information, please contact John Croce at Phybridge at +1 (905) 901-3633, john.croce@phybridge.com or by visiting http://www.nvt.com or http://www.phybridge.com.